1. Global market overview: Brace yourself for a negative day. U.S. stock futures are pointing down and European markets are all declining, with some key indexes dropping by over 1%. The latest uninspiring GDP data out of Europe may be convincing traders to sell. The data shows the eurozone economy grew by 1.6% in the third quarter compared to the same period in 2014. Growth slowed slightly compared to the second quarter. Asian markets closed in the red, with most key indexes dropping by over 1%. Traders in Asia may have taken their cue from the U.S. after the Dow Jones industrial average and S&P 500 each shed 1.4% on Thursday. The Nasdaq dropped 1.2% over the course of the day. 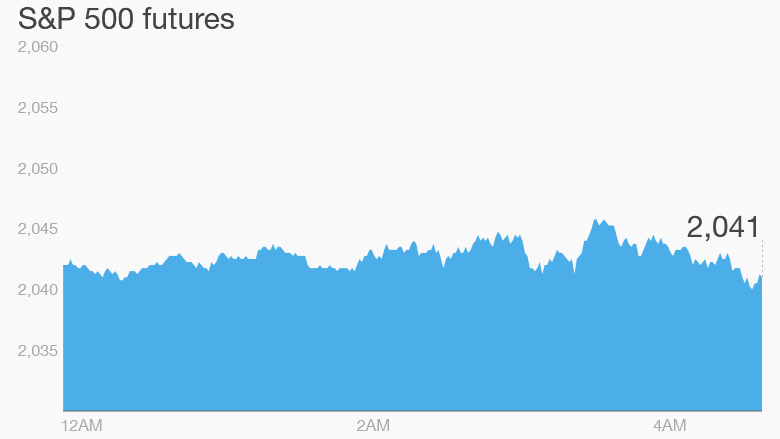 "The S&P 500 is experiencing its first legitimate selling pressure since September," noted Mike O'Rourke, the chief market strategist at JonesTrading. 2. Stock market movers -- Nordstrom, Fossil, Syngenta: Shares in Nordstrom (JWN) are plunging by 20% premarket after the company's earnings missed expectations. Shares in Fossil (FOSL) are also falling premarket, down nearly 18%, after the company said it was hurt by a strong dollar. Shares in Swiss agribusiness Syngenta (SYT) are expected to surge at the open after Bloomberg reported that ChemChina is looking to acquire the business. 3. Earnings: There's a trickle of earnings coming out Friday. J.C. Penney (JCP) will be among the main firms reporting quarterly results ahead of the open. 4. Economics: Investors will be keeping a close eye on the monthly retail sales report at 8:30 a.m. ET. This follows disappointing earnings from retailers such as Macy's (M), Nordstom and Fossil over the past week. At 10 a.m., the University of Michigan's Consumer Sentiment Index will be released with new November data.